It was raining in Los Angeles, which is never good news for the drive home from work. Added to that problem was word of a power outage in Laurel Canyon. Turning west on Hollywood Boulevard from Fairfax confirmed our worst fears. Slow moving traffic up the hill. We quickly decided to jog over to Greenblatt's. That quickly began to look like a bad idea, as the parking lot was jammed and service is never that good when we're the only people in the place. A five minute wait with no attention from the servers had us up and out the door. Let's try South Point, right across the street. The crowd was much more manageable at South Point and we sat near the window with plenty of elbow room. 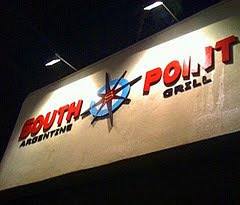 After quite a spell without wine, South Point Argentine Grill - formerly Gaucho Grill - has finally gotten the legalities squared away. It's a nice wine list, with a good variety of Argentine wines to go along with the meaty Argentine menu items. I had the Trapiche Malbec, from Mendoza. Trapiche is widely known as a good producer, growing grapes in the foothills of the Andes Mountains. I liked the look of it, deep purple as it was. The nose brought blueberries and cherries, with a little smack of vanilla as a result of the oak. The mouthfeel was quite full and complete. Black cherry and some spiciness were the stars of the show. I had it with the chorizo appetizer - which is enough for a meal, if you ask me - and the match was quite nice. The drive home was just fine after our little stopover, by the way.